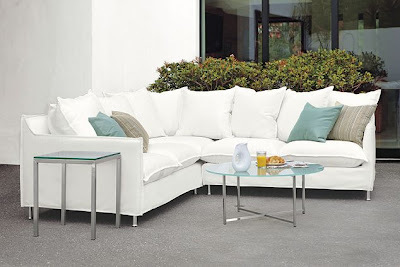 Kitchen and Residential Design: Room and Board presents outdoor upholstered furniture. 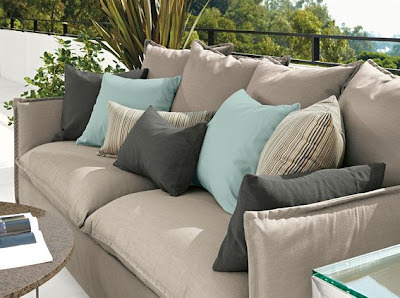 Room and Board presents outdoor upholstered furniture. This is Room and Board's new Brisbane collection. 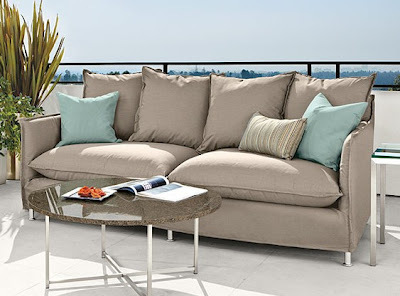 The Brisbane is upholstered furniture that's intended to be used outdoors. Everything about the Brisbane's been designed with weather in mind. 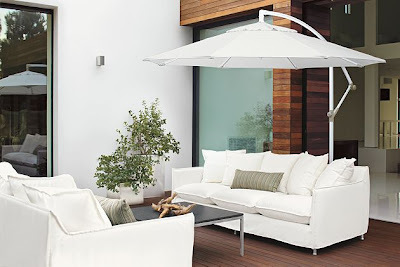 The frame is made from marine-grade laminated birch, the cushions are wrapped in a hydrophobic barrier and the fabrics are water resistant. 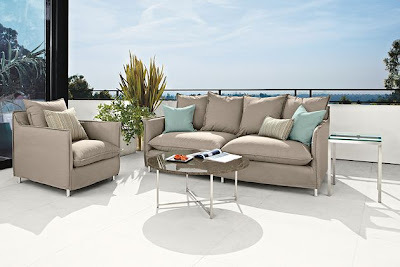 The tailored slipcovers are made from either Sunbrella® or Outdura® fabric. The slipcovers can be machine washed or just hosed off. Amazing. The stuff looks good too. I'll never look at a humble lawn chair the same way. Weather-resistant though they are, the furniture in the Brisbane collection should be covered or brought inside during winter or long periods of rain. Check out the Brisbane and the rest of the cool stuff on Room and Board. Thanks for posting about this Paul! I got so excited that R&B was going to introduce outdoor furniture, then started scratching my head when I saw how upholstered it is. What a video--I hadn't seen that! Still don't have a master plan, though I do have a new architect. So regretting not having anything to sit on, on the patio for over a year and especially for my first beautiful summer in this house. Want to buy something though I have no master plan, though the entire backyard may be torn up for the addition this summer. Is that terribly stupid? I'm feeling so antsy, living in this undone state. I'm sure this could all go faster, if I would just skip taking care of the four children for half a year, and selectively lobotomize my husband into agreeing with all my choices, no matter how misthought out. Gee, why don't I really want that either? Johnna: If you end up at the R&B in San Francisco let me know how this stuff checks out. I wish there were a magic wand to wave to make construction projects be over quickly and painlessly. However, stuff that comes easy never has any real value once it's done. Unfortunately, you have to earn appreciation sometimes. As with so many things though, once it's over your memory of the experience won't be as traumatic as the living of it. Keep plugging away!